They say “keywords make the world go-round” but I disagree. 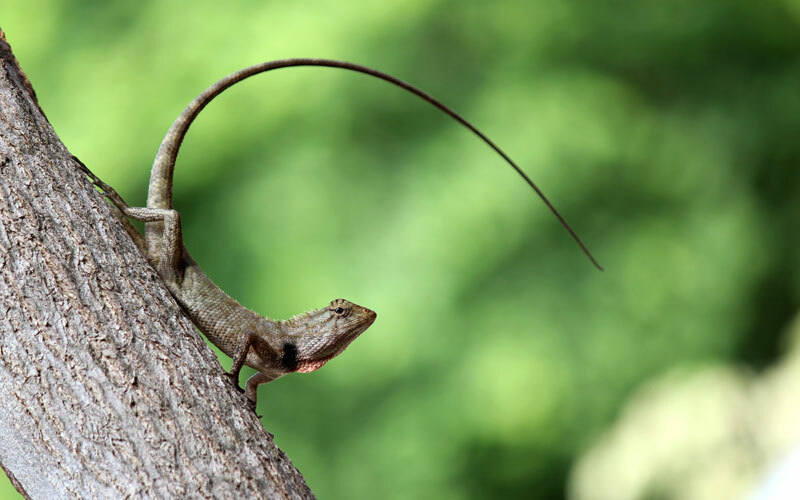 In my opinion, Long-Tail-Terms make the world go-round. We all know it’s important to identify the keywords that drive traffic to our websites. In other words, how did people find us through Google. Did they search for your company name, a product or service that your company offers or maybe some crazy misspelling of your full name. Google Analytics is the tool that we typically use to help peel back the layers of the onion and get to the organic keyword list. One problem with Google Analytics is that it collects SO MUCH DATA. How do you quickly drill down to identify the important information and not get lost in all the superfluous data? 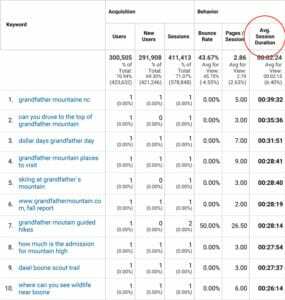 First I’ll explain how to get to the Organic Keyword section inside of Google Analytics and I’ll follow up with a few tweaks you can make in order to sort the data to be a bit more useful. Log Into Google Analytics here: https://analytics.google.com If you have multiple accounts you might need to select the correct Analytic Property from the drop-down at the top left. Select Organic Search to view all the keywords that have driven traffic to your site. One thing you might notice is (Not Provided) towards the top of the list. This will be talked about in a follow up blog post. Now for the magic step. Click on the heading “Avg. 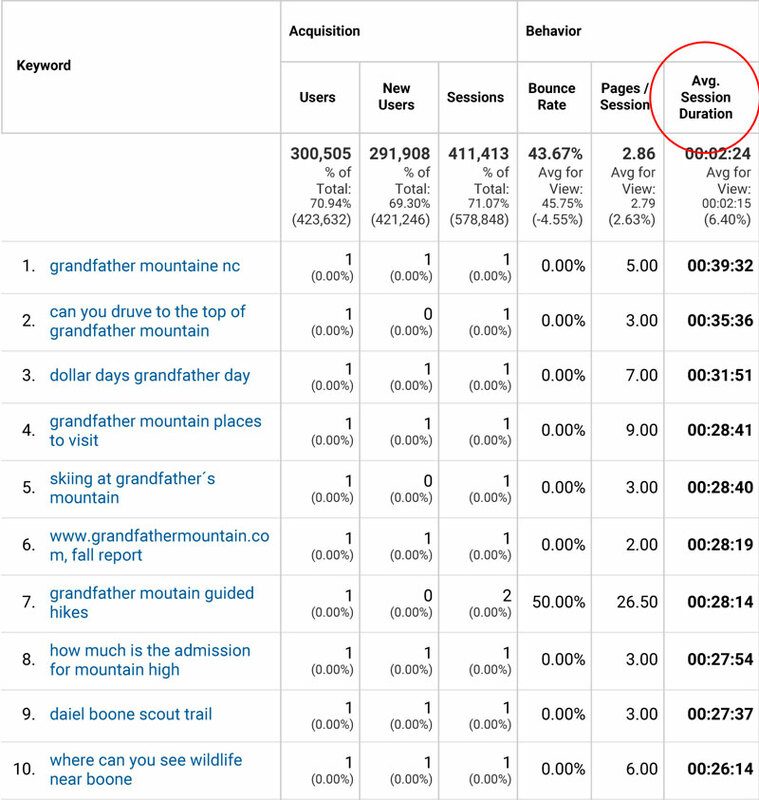 Session Duration” to sort based on how long people stay on your website from each keyword. By default, Google Analytics organizes the list of keywords based on total number of clicks but this gives us a list based on quantity, not quality. What we are interested in finding is a list of all the quality keywords (Long-Tail-Terms). A quick way to determine a quality keyword is to figure out how much time a person spent on your website. Also, users that stay a long time typically look at a lot of pages. By looking at the keyword list this way we are able to quickly identify the long-tail-terms and with this information we can do a few things to help increase traffic to our sites. If you’re interested in learning more about Long Tail Terms, Google Analytics or any of the other services that we offer, jump over to our contact page and get in touch.